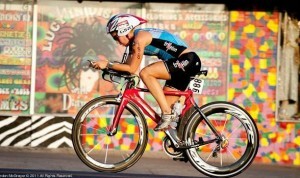 Natasha van der Merwe is Owner and CEO of Tri Team Transport. Tri Team Transport provides Texas triathletes with a secure, cost effective, convenient, and time-crucial transportation service for their bicycles and race gear to destination events within the United States. We transport to mostly Ironman Triathlon events but have also serviced Team in Training at a national level in transporting bikes to charity rides and events. Follow Tri Team Transport on Facebook here. Why are you excited for 2012 Fittest Entrepreneur? It’s a huge honor to be apart of the list with so many fit professionals. I am proud to live in one of the fittest cities in the US. What is your strategy for staying fit with your demanding schedule? On top of being a business owner, i am also a professional triathlete that competes almost every other weekend nationally and internationally, focusing mostly on the half ironman distance. With that being said, I train 20-25 a week. What is your current favorite workout to do and why? There is weekly group run that happens on townlake every Thursday with alot of the top triathletes and runners in town. I love testing myself and my run progression against all the other athletes on a weekly basis. And love the camraderie of the workout. What is your favorite gym, studio, or fitness class in Austin? Why is being a fit entrepreneur important to you? Being fit allows me to be me have more energy and be more productive when it comes to working. Fitting in time for both training and working also means that i have to manage my time well , and shows others that no matter how much you have to do for work , we all have time to exercise. What is your largest fitness accomplishment in the past year? Qualifying for and Competing in the 70.3 World Championships in Las Vegas last September in what was my first year as a professional triathlete . Only The top 30 pro women on the world rankings qualify to compete at the World Championships, so it was a big accomplishment to get to the start line. In turn , i had one of the best races of my short career to this point. Give one piece of advice to others looking to get fit and healthy as a busy professional. Working out and being healthy will give you more energy for the rest of the day and therefore make you more productive in the work place. Make working out a priority and put it first on the list for the day and work will easily follow. Not only will you get more done by prioritizing your workouts but you will also gain more confidence by being healthy which in turn will carry over into the work place. Lean Steak ( Sirloin ) , Sweet potato and Salad – i eat it the night before any race or big workout.